WHAT IS IT? The Model BR is a motorized brush style conveyor belt cleaner for use in heavy-duty quarry and mining applications to reduce the carryback of material. The Model BR will work in wet or dry applications, as well as on a variety of organic materials and metal fines. The powered brush turns in the opposite direction of the belt in order to throw the dislodged material back into the discharge stream. WHY IS IT NECESSARY? 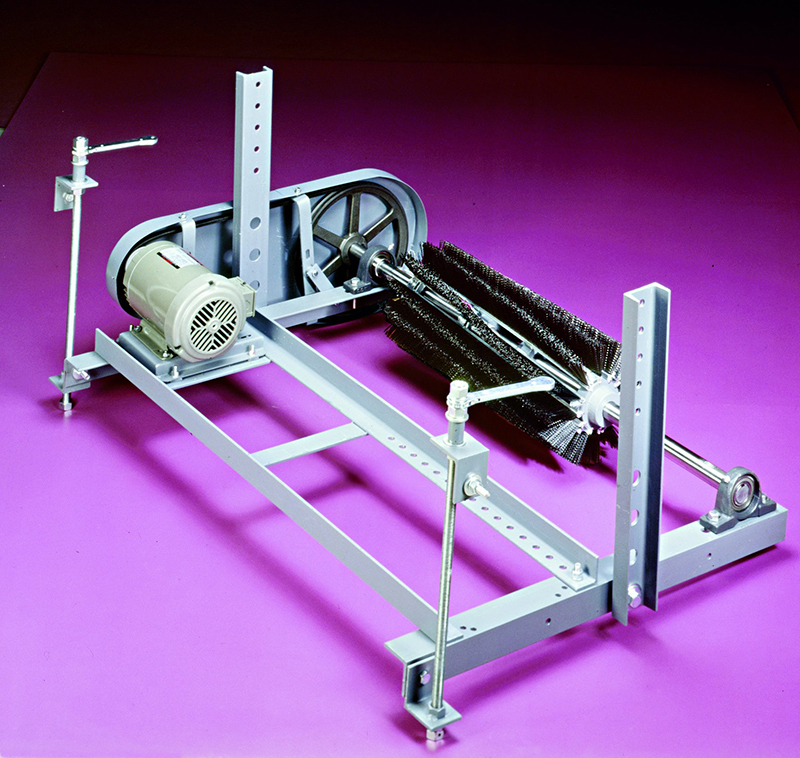 The Model BR is a good choice for use as a stand alone belt cleaner, and makes an excellent secondary belt cleaner when used behind one of our bladed primary cleaners in the more aggressive applications. Brush, motor, shaft, bearings, belt and belt guard, drive mechanism, etc. Sample model is BR(bristle diameter)(bristle material)(belt width), example BR040N36. Explosion Proof Motor and 575 VAC Motor Prices Available Upon Request. The bristle strip material is either nylon, polypropylene, or oil tempered wire. Other special materials available upon request. Nylon and polypropylene bristles are available in 0.040, 0.028, or 0.014 bristle diameters. Pricing varies. Oil tempered wire is only available in 0.010 bristle diameter. The unit is mounted on the conveyor by 4 mounting brackets, 2 for pivoting and 2 for tensioning. The operating temperature range is -40ºF to 180ºF (-40ºC to 82ºC).